Our Sitting Korky Bear with Advertising T-Shirt will look great with your business details and company logo upon the teddy bears little T-Shirt, sitting on your desk or everyones desk. These Sitting Korky Bear with Advertising T-Shirt and some of the other advertising teddy bears are some of the most popular promotional items we sell here at Calendar Lady Promotions. So help to promote your business details and company logo by having them printed upon our Sitting Korky Bear with Advertising T-Shirt today! To find out more about our Sitting Korky Bear with Advertising T-Shirt click here and fill in the contact form and we'll get straight back to you. 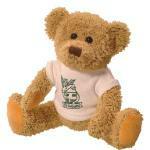 Other promotional and personalised items besides our Sitting Korky Bear with Advertising T-Shirt click here.